We’re not exaggerating when we say Eggstravaganza is one of Moore Farms Botanical Garden’s most egg-citing and egg-ceptional events of the year. More than 10,000 eggs will be laid out throughout the garden for children to hunt. Inside each egg, treasure awaits! Prized golden eggs will be hidden in the garden as well, and the lucky child that finds one will receive a special gift. Games, crafts and face painting are included as well. 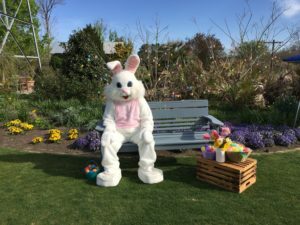 The Easter Bunny will be available for photos from 10AM-11:30AM. There is no cost for admission, and Eggstravaganza will occur rain or shine. Bring your own Easter basket. Questions? For more information, call 843-210-7592 or email Leigh Collins at lcollins@moorefarmsbg.org.